Danny Ching has just won gold in the Men’s Distance Race here at the 2015 ISA Worlds, giving Team USA a critical lead in the team standings against arch-rivals Team Australia and Team Hawaii. After two of the most entertaining hours of racing we’ve ever seen, Danny claimed the win just ahead of local hero Bicho Jimenez, who at one point looked set for the win. After the top 15 guys formed a steady draft train for the first three laps, Bicho made a break at the beginning of the fourth and final leg. With just a few board lengths lead, the dark horse from Team Mexico snagged a wave on the inside that extended his gap from 10 metres to 100 metres in an instant. From there the race became a 4km sprint to the line, as Bicho tried valiantly to hold off the chase group. 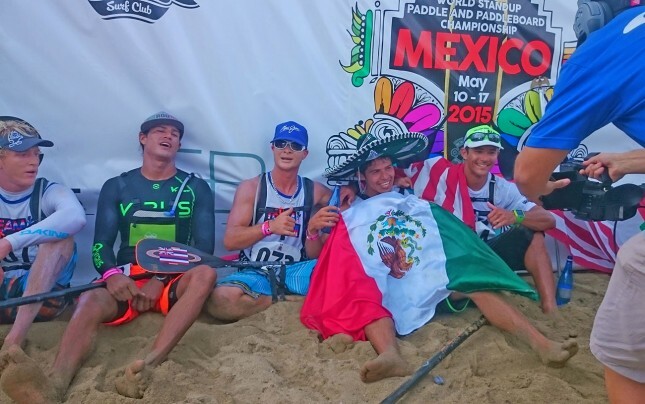 With the Mexican crowd roaring him on from the beach and the spectator boats, Bicho held onto the virtual gold medal position for a good 10-15 minutes. The tension, the excitement, the atmosphere was electric. The lead pack was splintering behind him as the likes of Georges Cronsteadt, Titouan Puyo and Danny Ching stepped up the pace and tried to close the gap. Eventually Danny was able to close the gap, but in doing so he’d broken the rest of the contenders, turning the contest into a two horse race to the finish. Over the final 1-2 kilometres, Danny tried hard but couldn’t shake Bicho, only pulling clear in the final hundred metres. 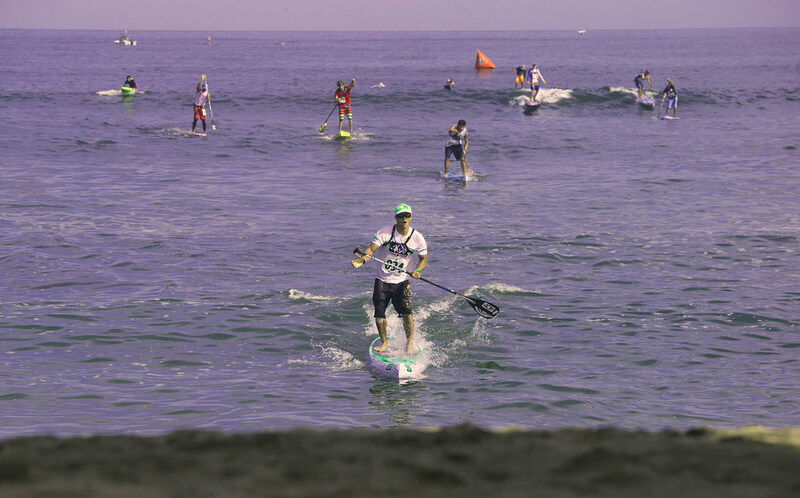 Behind the lead duo, the other top 13 guys were splintering badly, with only seven paddlers remaining in contention for the minor medals in the closing stages. This was an absolutely massive performance from Danny. The 404 front man had led in the early stages in a bid to break up the main pack, but such is the level of competition on show this week, Danny failed to splinter the draft train in the relatively flat ocean conditions. Unable to break away, Danny drifted back to 6th in the train, seemingly happy to let the others do the work. But when the race was on the line, and when Bicho looked to be paddling away like Speedy Gonzales, Danny put the hammer down in a vintage, determined effort. Once again, Danny Ching has shown us he’s still the king. Danny eventually claimed the win by a margin, catching a bump and pulling clear of Bicho in the 200 metre final sprint in from the final buoy to the beach. 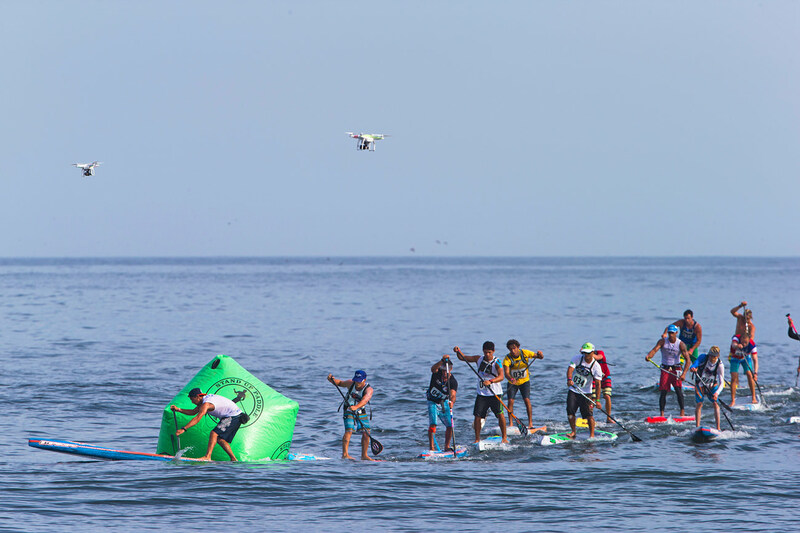 Bicho was left in flat water paddling to the shore, and the Rogue team rider was almost caught by the chase group charging in on a set wave. But he held on for the silver medal and received the loudest possible cheer from the local and vocal supporters crowding the finish line. Bicho became an instant folk hero here in Sayulita, with the quiet youngster being mobbed by team mates, family, friends and random supporters the moment he crossed the line. Behind Danny and Bicho it was an intense sprint for the minor medals, with Casper Steinfath and Georges Cronsteadt looking set for the podium before Connor Baxter, Zane Schweitzer and Titouan Puyo scored a perfect set wave, which left five guys on one wave fighting for two medals. The Maui boys Connor and Zane won the sprint up the sand to give Team Hawaii – who has shown exceptional team spirit this week – a podium double and some very valuable team points. That left Casper in 5th, defending champ Titou in 6th and Georges Cronsteadt in 7th for Team Tahiti. Fernando Stalla was on the next wave, taking a photo finish for 8th/9th with Leonard Nika from Italy, who himself had sat at the front of the train for much of the race. Slater Trout snuck in for a Top 10 finish that gave Team USA an additional haul of valuable points. Though one of the big stories of the day was Team Australia’s lowly finish. Their big hope in the Distance Race, Beau O’Brian, stayed with the main pack for the first three laps but then faded badly, clearly feeling the effects from a bout of food poisoning earlier in the week. Beau’s team mate Toby Cracknell, more favoured for the Course Race, came home 11th to give the defending champions relatively few points for the overall team standings. 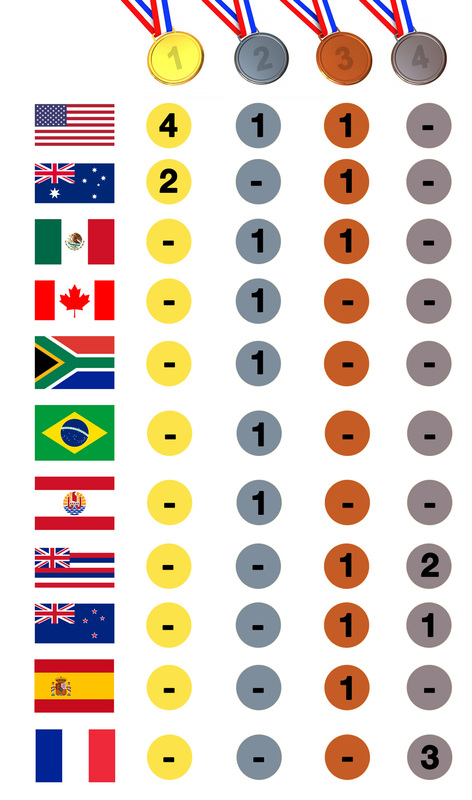 This is the first time Australia has failed to make the Top 10 in the four year history of this World Championship. That’s a huge development in the race for the team champions trophy. Beau wasn’t the only one to suffer though, with Brazil’s Vinnicius Martins, New Zealand’s Armie Armstrong (who had to be put on oxygen at the finish) and Holland’s Bart de Zwart all battling illness on the eve of the race. It was hot and draining out there today, and those who weren’t feeling 100% were mercilessly exposed. Another surprisingly low finish came from Eric Terrien, third in this event last year and a medal contender this morning. The Frenchman was shattered with his performance, commenting on Instagram that perhaps this was the beginning of the end for his professional racing career. Indeed, Danny’s performance certainly was a comeback. On the third lap Danny looked slightly deflated. He’d spent the early part of the contest unsuccessfully trying to break the pack, and when Bicho made his move it took him several minutes to respond. In fact the champ fell at the buoy turn just as Bicho was sprinting away, which was an extremely uncharacteristic move and suggested Danny was perhaps feeling tired from his last-minute trip to Mexico (the Team USA star only flew in last night). 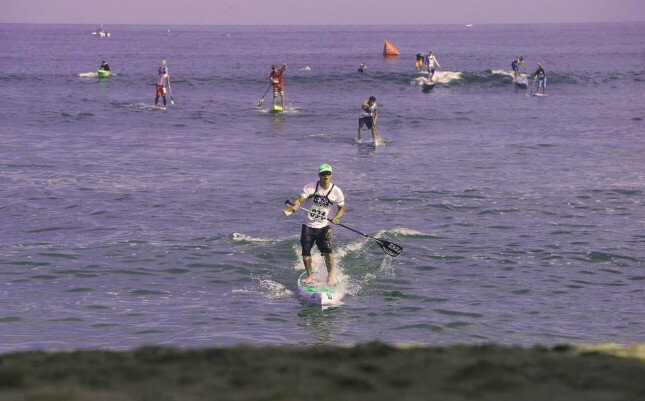 At that point Danny was sitting in about 7th, with many of the world’s best paddlers directly in front of him and an inspired Bicho roaring away out in front. But as the competitors rounded the outside buoy to begin the long “back straight” section of the course, which saw them paddle for about 2km in a dead straight line, Danny clicked into gear and began his surge. First, he moved down the outside of the main draft train and took control of the driver’s seat. Then he stepped up the pace in pursuit of Bicho, taking just minutes to reel in the fearless local. None of the other contenders could go with Danny when he surged, leaving only Bicho in contention for the final mile of the race. It was a vintage performance from one of the sport’s all time greats, and it was done against one of the most competitive fields ever assembled. 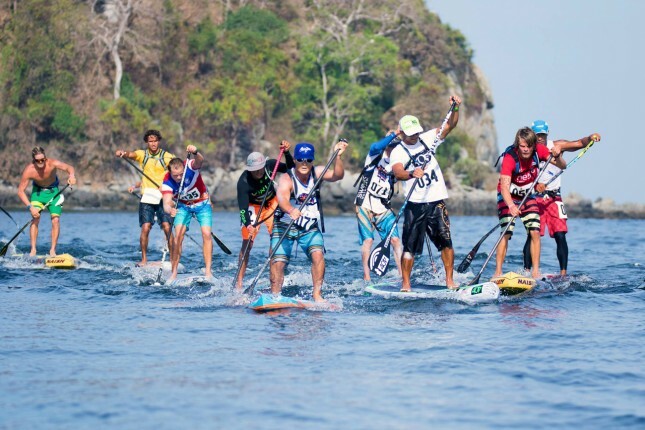 That high level of competition means the 2015 ISA Worlds Men’s Distance Race has had a big impact on the SUP Racer World Rankings, with plenty of changes on the Top 100 Leaderboard. Danny Ching’s total points tally has risen, with the guy in the green hat moving within striking distance of world number one Connor Baxter. Bicho Jimenez is the biggest mover though, with the new Mexican folk hero jumping six placings to world #13. Japan’s Kenny Kaneko, who had a superb race to finish 12th against this uber-competitive field, rises 19 spots to world #53. Unlucky is Slater Trout, who had a solid Top 10 finish today but dropped two spots after the Mexicon duo of Fernando and Bicho edged ahead. On the ISA leaderboard, Team USA now takes a commanding lead of approximately 400 points over the Aussies, with Team Hawaii nipping at the defending champions’ heels. Australia was spared further blushes when young Lachie Lansdown won the prone distance race for the Green & Gold, however he was just seconds ahead of Team USA’s Jack Bark which ensured Team USA finished the day well ahead. That was an amazing race. I was loving every minute of it out there in the lead boat, while I could hear Jamie Mitchell losing his voice alongside Beau Hodges back in the booth. The boys were absolutely spent at the finish. Several collapsing as the crossed the line. They gave it all in search of individual glory and, even more importantly, the pride of their nation. We thought the short, sharp Course Race was going to be more exciting than the Distance, however that was one of the most entertaining spectacles I’ve ever seen.